In 1963, an alluvial ruby deposit was discovered near the settlement of Luc Yen, 210 km NW of Hanoi, in North Vietnam. By 1989, mining was established and the Vietnamese rubies appeared on the world market. Placer deposits occur on bedrock of karsted limestone at their contact zone with granite. The geological setting suggests that the primary sources of the placer deposits were ruby- and spinel-bearing skarns and probably anorthosites. The Luc Yen placer deposits are in the valley of the Hau Shum River, a tributary of the Song Chai River (in the Songka River basin). Three alluvial placer deposits have been found in this area. Two parallel placer deposits extend along the valley for 3 km (northern placer) and 1 km (southern placer). The third deposit is irregular and equidimensional in plan. The productive sandy-pebble-gravel layer is 1.2 to 2.5 m thick and occurs at a depth of 1.5 to 2 m. In addition to ruby, the placer deposits contain pink and violet spinel, which is especially common in Anfu site, as well as pink, less abundant, green or colourless sapphire and occasional tourmaline. 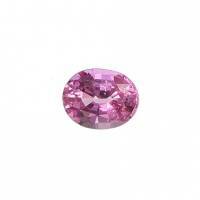 The rounded, subhedral ruby grains are 1 to 3 mm in size and occasionally reach 5 mm and more. Opaque and translucent prismatic crystals of red corundum reach 2 to 3 cm in length. The colour of the ruby ranges from pink to bright red and crimson "pigeon's blood" ruby. The refractive index is 1.760 - 1.770, density is 3.93 - 3.98 g/cm³. Inclusions of calcite, zircon and dust-like inclusions of rutile are typical of these rubies (Henn, 1991).